EA Builder | Forex Software Programming Reviews | Forex Peace Army. Note that EA-Builder.net only codes custom EAs. It does not sell software or wizards for creating EAs or indicators yourself. Phillip does excellent work at reasonable prices. He stays in touch long after delivery of project. Phillip is also a trader, so he can also help finetune your strategy. A couple of weeks ago I wrote one review suspecting that eabuilder.net was a scam and had promise to update the case here. At first, the events suggested one thing, but later they revealed unfortunate facts and problems with communication, which I describe below. Few days after my testimonial here, Phillip email me (without knowing about my FPA review, it had not been published yet) explaining the gravity of his illness and compromising himself to deliver the EA. Two weeks later, he kept his promise and send the EA working exactly as I had asked him before. In short, the communication problems was the real deception here. Without reply, I thought that was being conned (like many of us had taste once in life). Fortunately I was wrong: Phillip is an honest and talent coder. Despite the late, the work was great, at very good price. And, of course, was not his fault to be that sick. I wish that my last review dont hurt his good and deserved reputation. Best Regards to all FPA Comunity. Jun 24, 2017 - 1 Star I found ea-builder.net here in www.forexpeacearmy.com and thats why I would like to give my statement. Look like other people had good experience dealing with them, so I thought the same would happen to me: well...I was wrong. I contact ea-builder at their site (www.ea-builder.net) asking for a simple EA, with only 2 indicators. The intial answer was quite fast and cool (someone named Phillip), But it last just until I made the payment (at May, 29). At Jun, 06, I broke the silence asking for news about the work (the initial deadline was 4 days). He said that was sick, but would deliver at the end of that week. Well, I send 3 emails after that, but he never answer again. I have all the emails/Invoice to prove this. I asked for my money back today (without reply until now). I dont know what you think, but it look a lot like a SCAM to me. If there are any answer, I will keep you updated. I asked for a quote for my custom indicator with www.ea-builder.net and they got back to me within a couple of hours. We proceed for a decent price and 2 days later I got my indicator - much better than expected! 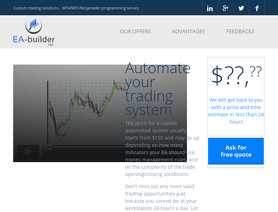 I think they must be the best Metatrader programmers, let me know if you find other similar services cause I haven't found any like this yet. Completely satisfied with all the indicators I have created. Soon I will start creating my own EAs. Excellent EA Programmer. Efficient, Sufficient, Superb. Communication and understanding is on point. Highly recommend. Best EA Programmer Ever. Quick coding with high quality. Always helpful and quick responses!